We are huge fans of tuna at our house. My husband is not a real fan of mayonaise so we eat this amazing Italian Style Tuna Salad No Mayo ofen. It is filled with fresh tomato, olives and parsley and tastes amazing! Hi, friends. 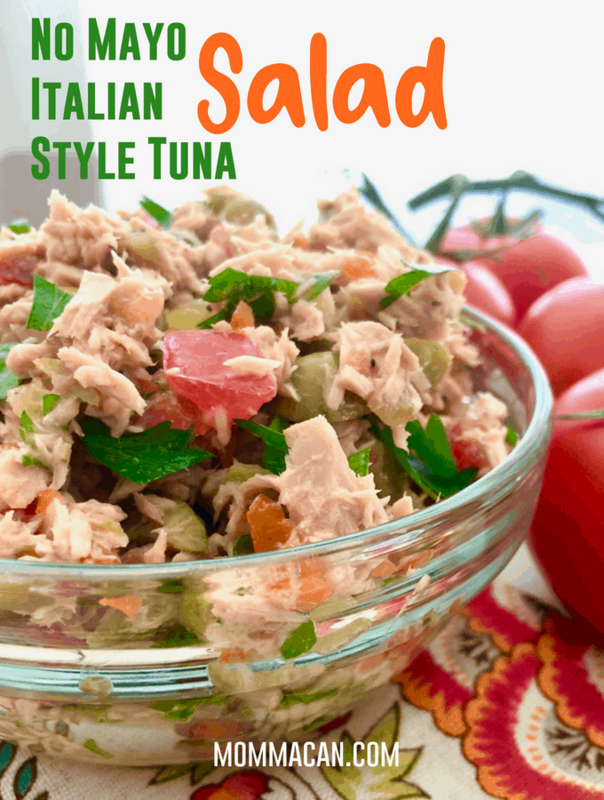 Today I am sharing a fabulous Italian Style Tuna Salad No Mayo Recipe. I remember distinctly the moment I learned that tuna salad was not always swimming in mayo or Miracle Whip. In fact, tuna salad does not actually have to have tuna. It could have leftover red snapper or salmon. I have always been a Foodie so listening to other folks talk about their passion and heritage was a big deal to me. Fr. Bruce’s mama, told me what she had made with leftover fish during Lent many years ago. She explained she saved the fish and added lemon, olive oil, and just a hint of scallion and chopped celery. I was literally frozen for a few seconds and realized my inner Southern cook had a whole bunch to learn. You can go to culinary school and learn the proper cutting methods and the correct temperature for a perfect roast. But honest food, the kind that makes memories is all about experience and people. 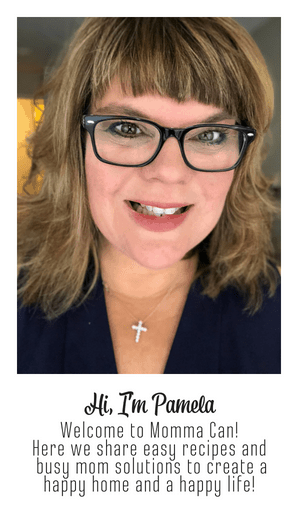 Not only did Mrs. Cinquegrani raise two wonderful sons who just happened to be awesome Catholic priests, but she was also one of my foodie mentors. And this moment, from my youth, is what inspired my Italian Style Tuna Salad No Mayo Recipe. 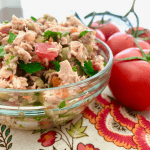 Fresh tomato, parsley, scallions, folded into chopped green olives and yummy wild caught tuna served on a bed of lettuce or tucked in a fabulous Italian roll. This recipe is so darn good. I am serious, this recipe will dazzle your palate and folks will wonder where the heck the mayonnaise is but still ask for seconds. I want to let you know that I have taken the plunge and switched to wild caught tuna . But honestly, buy your favorite brand to make this dish. I use water-packed tuna when not using my favorite Wild Planet brand because I the dish has olive oil and the flavor stands out more. You can rinse oil-packed tuna! You can find the Wild Planet on Amazon.com and at Costco. I have purchased from both. The Wild Planet Tuna comes packed with sea salt only, no water or oil. It tastes great! 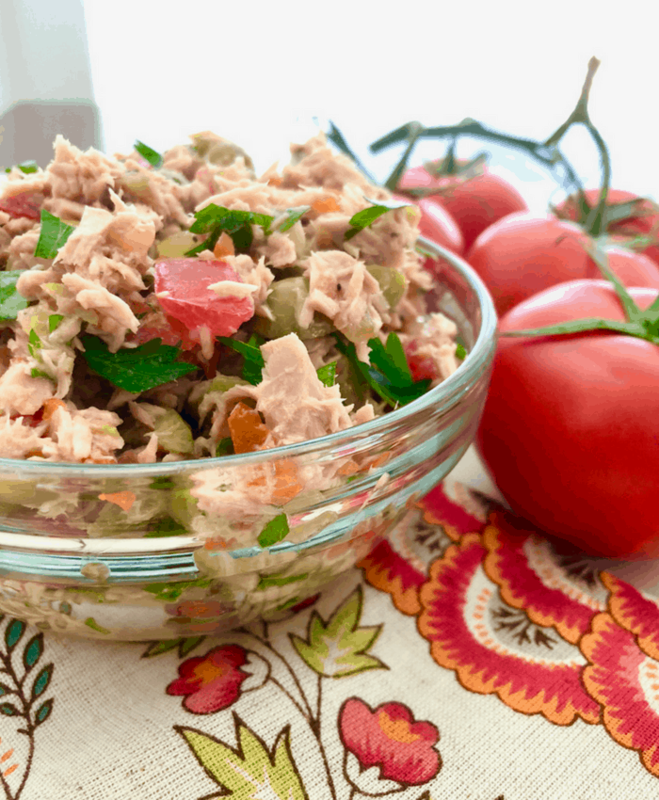 Here are a few more tuna salad recipes. Tools for this recipe are minimal! Chef Knife – for slicing and dicing! Now the recipe for this awesome tuna salad! Fresh, light, and delicious Italian style no mayo tuna salad. Perfect for any occasion. Combine all ingredients in a medium-sized glass bowl. Serve at room temperature right away or refrigerate up to two days. Serve this over a bed of lettuce or on bread or rolls! It is truly amazing. Sounds fabulous! I added tomatoes to my tuna one time and ow that is the only way I eat it! It makes it so cool and fresh tasting. Sharing! Thank you for sharing on Merry Monday! Hope to see ya next week! Thank you! we really love this no-mayo tuna salad. My youngest son hates mayo, so this may be the perfect tuna salad for him. Do you think we could use regular olives? Pinned and will be including this on this week’s features. oh yes! Any olive will work!